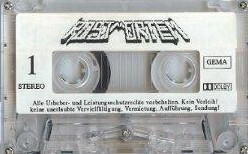 German deathsters Postmortem began their career in 1987 with Matthias Rütz - Vocals, Marcus Marth - Guitar, Tilo Voigtländer - Bass and Marko- Drums. Their full length, Screams of Blackness was released in 1993. Xeroxed covers. Tapes with stickers on the shell..
Glossy covers that folded out. Tapes with stickers on the shell..